Rewards Canada: Aeroplan introduces dExclusives rewards for Distinction members - tell us which one you like for a chance to win 5,000 Aeroplan Miles! I'd bid on the world cup trip! I think more trips to select sporting events that include flight, hotel and meals would be awesome! If it weren't already outside of my Aeroplan account range I'd bid on the World Cup trip. I think more "destination" style trips could be cool to include: African Safari, Tasting tour in Tuscany, etc. Of what they have I would bid on the world cup prize. For future auctions it would be cool if they offered a large lump sum amount of aeroplan miles like 1,000,000, or some sort of arrangement where you could take a free round trip flight anywhere in the world once a month for an entire year. I'd love the Napa Valley Wine Trip - great area and I'd love to ride the wine train. The World Cup experience. I would like to see more unique packages like that. I'd bid on the Wimbledon finals! I'd like to see more sporting events included in the auction. I'd be bidding on the World Cup experience if I could - and other packages like that (Stanley Cup, etc.) would be nice, especially smaller, more affordable auctions (for those of us with less miles). I love the idea of the packaged tour options, and like how they include everything you need (hotel, flight, transport). I really like the world cup one, and the Napa Valley experience sounds lovely. Would certainly bid on the World Cup package. Hope dExclusives brings more trip packages in J, especiallt to Asia. The New York package would be great!. For future auctions there should be a mix of small and large items. Many of us don't have the points for the large packages, but would like to participate. Many of us may not be big point earners, but we are loyal to Aeroplan! I think the World Cup Package sounds promising! World Cup package is my current choice. Air Canada status would be a nice option. Gotta go with the World Cup package! For future dExclusives auctions, I'd like to see more farflung, really exotic and unknown places. As in, you could use your Aeroplan miles to fly to (place you've never heard of). The World Cup package is clearly the top of my list.... And how about adding the opportunity to see all of the Grand Slam tournaments in a Tennis! Def World Cup as top pick, once in a lifetime experience. Would love to see multiple stop Round the World trip, first class on the top Star Alliance carriers. Money can't buy items seem the most interesting offers! I would bid on the World Cup trip or Wimbledon. I like the idea of offerring Status, lounge passes etc. However, the lengthy bidding window means that bids on some items have already exceeded the value of the package (eg. Broadway). How about some flash or short duration auctions where there is a chance of getting a bargain. The trip to New York would definitely be great for me. Seeing Broadway shows and the Big Apple would be a great way to use my Aeroplan Points. I liked both the Broadway and Wine Country auctions, but they are both getting bid up far beyond the value of the points. I would like to bid the World cup trip to Brazil, it will be once-a-life-time experience. I don't like any of the options. Why isn't there something cultural offered? The Broadway plays offered are simply more pop culture. Aren't there any special exhibitions upcoming at the Museum of Modern Art or Metropolitan Museum in New York or? Why not operas? I like the wine tasting in Europe idea, and the Stanley Cup playoff idea. Why not to cities (like Edinborough) with theatre festivals? Wine tour, hands down. A trip with a near endless supply of reds ... heavenly. I like the World Cup in Rio. I'd also go for a Grand Prix or the 2016 Olympics in Rio. Even a stroll down the beach in Ipanema would be pretty fine. If I had lots of Aeroplan miles I'd bid on the Broadway weekend in the Big Apple. What I'd really get excited about would be bidding on different kinds of lessons with pros around the world. Like a pro chef in Paris giving cooking lessons. I'd also bid on a personalized new wardrobe designed by a fashion consultant in Milan or New York. How about skiing lessons from a pro in Switzerland? Golf lessons in Maui. The list is endless! NAPA VALLEY WINE TASTING GETAWAY! I'd love to see more adrenaline inducing, all inclusive packages in future dexclusives auctions. If I had to bid, New York & Broadway. That is how I feel today. Ask me another time and you will get a different answer. To that degree, in future there should be quite an eclectic selection of items to bid on...Jacques Villeneuve Driving Academy, Rocky Mountaineer Experience, Cooking instructions from established chefs/restaurants. Wine tours, extra in a TV show or Movie, Cruises, Family Reunions, Make a Wish for my Special Relative, Family Day at Disney, or Medieval Times, or Amusement Park. Family Dinner with Limo ...and the list goes on. I would bid on around the world plane tickets and for "money cant buy experiences" like behind the scenes meetings/lunches with famous inspiring people. Would also like promo like special flights; lounge access passes. The New York weekend sounds like fun. I love the sound of the Napa Valley escape. Grand slam London! Hopefully it includes airfare. Broadway Weekend in the Big Apple as I love theatre. Travel interests me the most. Put me on the Brazil flight for the World Cup! Napa Valley would be first choice. Future auction choice would be California adventures. Broadway weekend. I would like see Stanley cup final auctions in the future or World Series tickets. I would love to bid on the NAPA valley escape. What could be better than sun and wine! Napa would be great but in future I would like to see some adventure packages such as an African safari or trip to Machu Picchu. Escapes with travel in minds especially warm locations during winter months. World soccer in Brazil would be a dream vacation! World cup soccer in Brazil is what I'd bid on. In the future I'd like to see all included ski vacations. tennis in london. rafa and djokovic. the best. I like the idea of a travel escape package like napa or Broadway... More inclusive and special than redeeming just for flight and hotel but hopefully not absurdly expensive. Also, these could probably be offered more often so there is a better chance of winning an auction. I would bid on Queen and Adam Lambert except I am already going with three good friends. It should be a riot. I like to save my miles for travel, so small endeavours like this one appeal to me as they wouldn't cost too many miles. World Cup soccer in Brazil! I'd bid on exotic experiences and destinations. I'm thinking Burma, Vanuatu, Nepal, sky diving, base jumping, pyramids, having my own boat and skipper for a day, etc. I save my points for those once-in-a-lifetime type trips that will bring me lasting memories. I would bid on 3-4 day trips to U.S. destinations which would include 4star or better hotel, flight and attached with attractions to see. Many more flight rewards, upgrades,etc. Also electronic gizmos. Concerts, etc do nothing for me. I would bid on the World Cup, but I would love to see a round trip to Egypt to see the Pyramids. I would bid on Lady Gaga tickets! I would vote for World Cup Soccer in Brazil or Grand Slam Tennis Finals in London. The local concerts don't strike me as anything unique or exclusive. I'd bid on flights to Australia (Melbourne preferred or Gold Coast). I would bid on tickets to the Montreal Canadians hockey game. I would bid on flights to anywhere in Canada! It is not that I don't care about others, but I care more about spending money within our country so that it benefits our people and our economy than spilling it elsewhere, uh! I would bid on the Broadway Weekend. The escapes are most interesting. Agree with another user that weekend getaways including airfare and hotel including a key event (sports, broadway show, concert, wine tour) would receive a bid from me. A combo of urban and more exotic destinations are always good. I am all for creativity! I would bid on dinner with an influential figure OR a week getaway in a villa in a distinct beautiful destination. BUT...of the choices DEFINITELY the world cup tickets!! The Gibson "All Stars" guitar would be nice....how about a trip to Machu Picchu, ancient capital city of the Incas, high in the Andes mountains near Cuzco, Peru? We scuba dive, so a dive trip with J airfare to the Coral Triangle would be awesome! Weekend getaways including airfare and hotel including a key event (sports, broadway show, concert, wine tour) would receive a bid from me. Love to see One Direction tickets for the Toronto show in July be available as a bid. I'd bid on a trip to Australia / New Zealand. A week in Paris would be very tempting. Events and adventures interest me. I would love to see One Republic in Toronto. I would be interested in a weekend air and hotel getaway from Calgary to US. I would love European adventures like olive oil tastings, wine tastings, outdoor operas, small group Tuscan tours etc. Also family adventures like go-karting or front of the line access to fairs like the PNE. My husband loves the idea of going to the soccer World Cup but he doesn't have enough points yet for that. Flight rewards, definitely, but they have to be worthwhile i.e. I don't want to find the value of the reward seriously devalued by add-ons and surcharges (such as the fuel surcharge that is added for domestic reward flights but not for tickets that are purchased). I'd like to bid on flights and hotels in Switzerland, Philippines and China. How about ticket to Andre Rieu's and Sarah Brighton's concerts? Flight and hotel rewards to Europe, China and India. Tickets to Yari, Sarah Brighton and Zubin Mehta's concerts. I would try the Broadway weekend in the Big Apple. Definitely the Broadway experience NEW YORK!!! I would bid on the Flight rewards, like an Australia flight, tours and local experiences would be great for future auctions. Of the ones listed now I like the Napa Valley Wine Tasting Getaway. For future I would love to see trips to Europe. I would bid a Dream European Trip!!! The Napa Valley wine tasting auction item has the most appeal to us as requires the least amount of forward planning to take. It's less of a dream and more of great way to burn miles. I would definitely bid on business class tickets to anywhere. In the future, I would like to see some all inclusive Air Canada Vacation packages that are available for auctions. I like the Napa Valley wine tasting. It combines two passions: wine and traveling! I would like to see future auctions around one of a kind travel experiences with 'celebrities', a la basketball game with Shaq for instance. I would definitely go for the European river cruise, hands down! Napa Wine Tasting. I have always wanted to go. I would love to bid on business class tickets to anywhere Air Canada flies. In the future, how about business class tickets to some obscure destinations? I would bid on the Soccer World Championship in Brazil but the current bid of over 1 million miles is too rich for my blood. I would like to bid on the Soccer in Brazil! Let's see auctions for Hawaii and the Grand Canyon! contest. Thanks Rewards Canada. Thanks Aeroplan. I would bid on the Napa Valley trip and concert trips would be a wanna-see. I'd bid on the European river cruise and would love to see some tech bid items too! How about a trip to the Masters? I would like to see a trip to the Super Bowl. 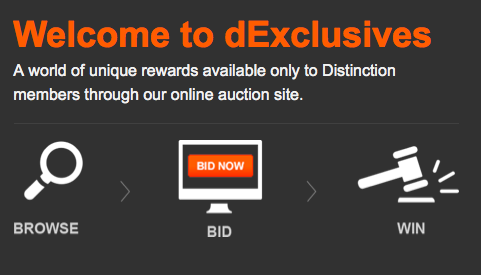 I would bid on the "WORLD CHAMPIONSHIP SOCCER FINALS IN BRAZIL: JULY 5-15, 2014" http://dexclusives.aeroplan.com/iSynApp/auctionDisplay.action?auctionId=197466 and items I would like to see in future dExclusives auctions would be more locally sponsored events. Would love to go for European River cruise...!! I would bid on 'once in a lifetime vacations or trips' - something I would not normally be able to afford. Trip to the battlegrounds of Europe, the Somme, Ypres, Normandy beaches. Something we all should do once in our lifetimes. I would love to win a bid to Wimbledon and soak up London while there. A dream future trip would be a safari in South Africa, with a stay in Cape Town. I would bid on the Broadway weekend in the big Apple! I would bid on business class tickets to destinations outside of North America. The Who - 50th Anniversary Tour in Britian. Stanley Cup finals ticket with airfare to wherever it is in North America. 3 or 4 night stays at hotels that are unique and in cities that Air Canada flies to. Exploring NYC with the Broadway Weekend in the Big Apple. Stanley cup tickets with flight ! I would love to bid on the Napa Valley auction - what a great few days it would be! FIFA World Cup Finals for me....Awesome once in a lifetime prize.